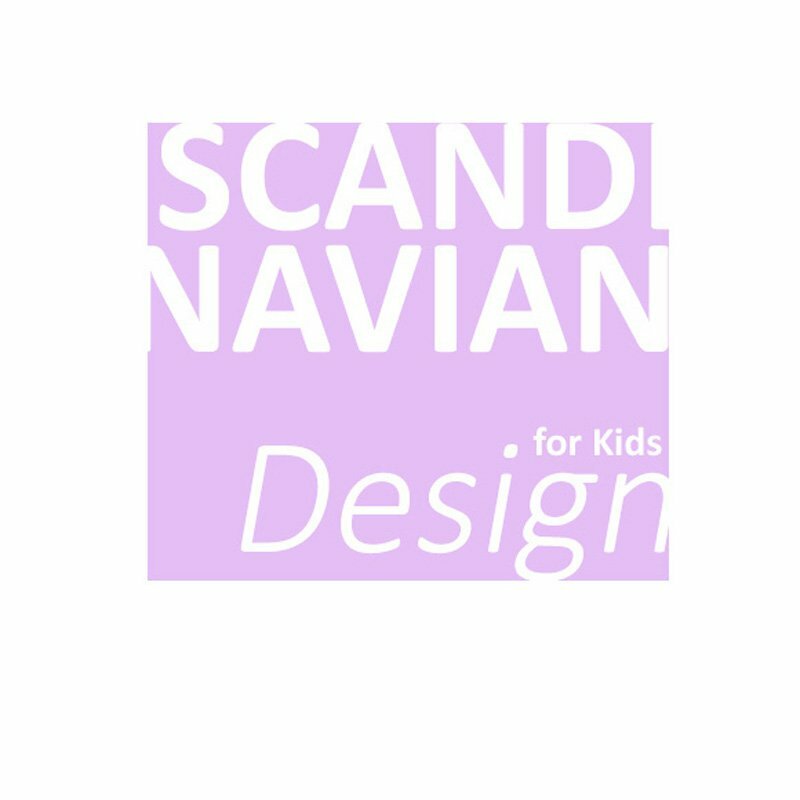 Our carefully selected mid-high loft bed ROOM STAR in the elegant and stylish and classic Scandinavian design is the bright spot in every child! The half-height loft bed ROOM STAR can later converted into a day bed or bed base. These single axle only have the so-called H-posts, these are the extension poles that make the bed to bunk bed, as well as the conductors are removed - and finished the day bed. Under the daybed can then, for example, even an optional bed drawer to be pushed for additional storage or as a guest bed. The default failure protection front with a height of 45cm for extra safety. 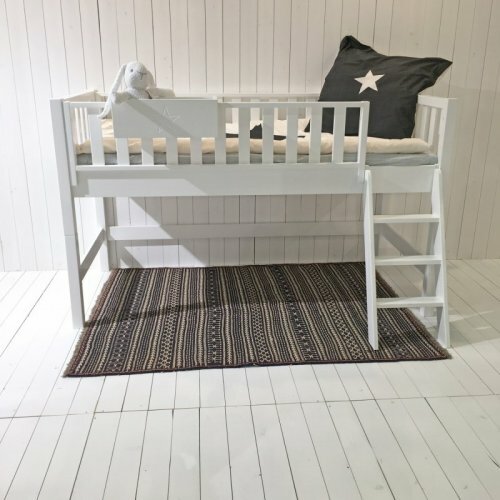 For example, in conjunction with our high bed mattress ELBBRISE with a mattress height of around 12cm is the failure protection on the mattress stately 33cm. The requirements of EN standard 747-1 / 2 argue for only 16cm. The requirements of the standard are so far exceeded in this connection. In addition to the bar formality and the materials but convinces the elegant lines of Scandinavian design that makes this semi-high bunk bed at a very attractive multifunctional bed. The advantage of half-height loft beds is that the parents also can easily reach the child without having to stand on tiptoe. 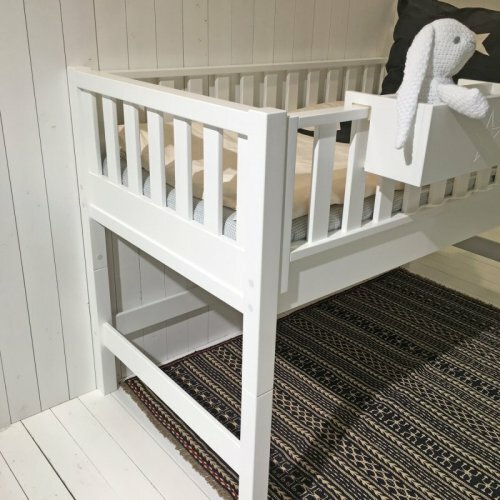 (Supplied slats, mattress not) with a mattress size 90x200cm, this noble wedding bed and plenty of space, so that it can make your child really comfortable. 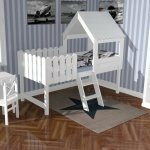 The use of solid hardwood in conjunction with MDF ensure that you will have long to this loft bed much joy. Especially Scandinavian design, with its refined simplicity, ensures that this bed fantastic harmonizes with the device in almost every nursery. The basic bed and high bed set is made of solid wood and MDF and designed for the mattress size 90x200cm. The paints used for the bed of course, comply with European standard (EN 71-3). A mattress is not included in this set. Matching mattress you will also in our shop here. 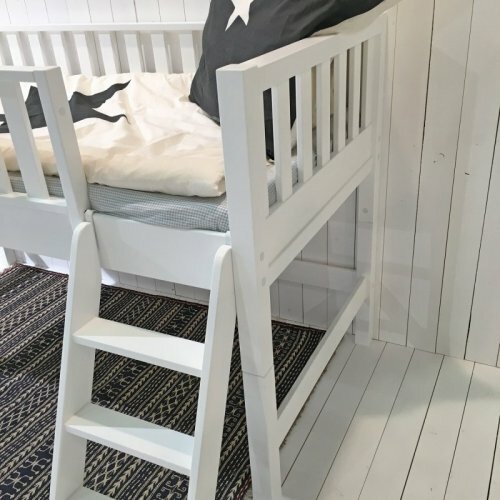 This half-height loft bed, there are also higher in the 160cm version. 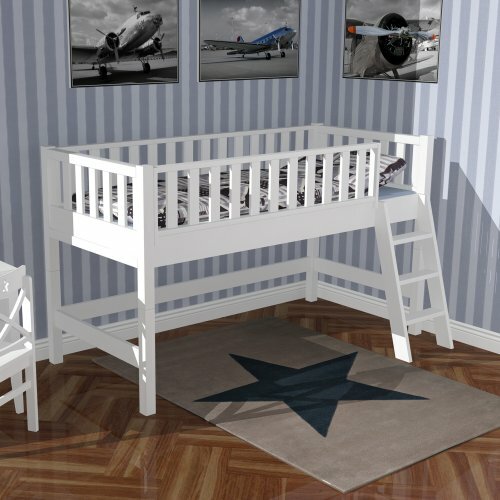 As mattress we recommend the bunk bed mattress ELBBRISE that they can contact us here. 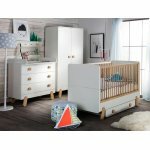 Das halbhohe Hochbett ROOMSTAR kann zu einem Tagesbett mit Rausfallschutz hinten umgebaut werden oder zu einem reinen Basisbett, d.h. ohne den Rausfallschutz hinten. 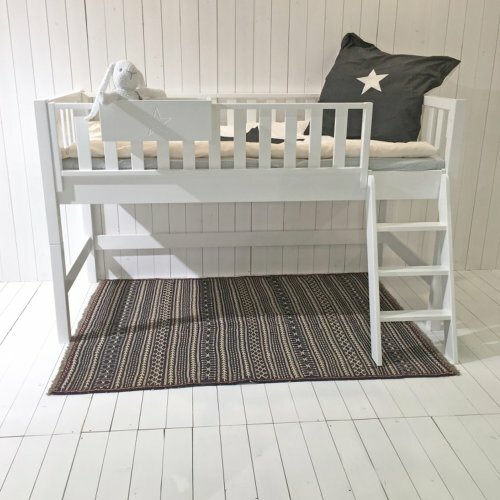 Mit entsprechendem Zubehör können Sie das halbhohe Hochbett aber auch zu einem Hochbett mit 160cm Höhe umbauen. Hierzu werden nur eine neue Leiter sowie auch entsprechende Verlängerungen für die Höhe benötigt.